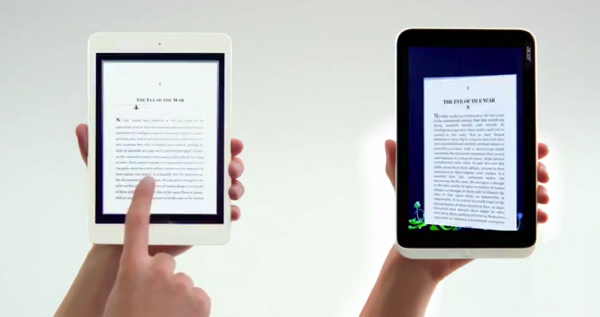 Microsoft has released its first ad targeting the iPad mini, by comparing the Acer Iconia W3 Windows 8 tablet versus the iPad mini. Again, this commercial sticks to a previous theme of using Siri’s own voice to detail its own ‘shortcomings’ compared to the Windows 8 tablet. The competition just got smaller. See how the Acer Iconia W3 stacks up against the iPad Mini. Just yesterday, Microsoft released an ad comparing the iPad to the Surface RT, which the company recently took a $900 million write down on (and slashed the price) due to excess inventory.